Tray sealing machines for higher speed tray sealing applications for consumer products, clamshells, pharmaceuticals and nutraceutical products, we have various style of tray sealing machines: rotary tray sealer, and rotary clam shell heat seal press. 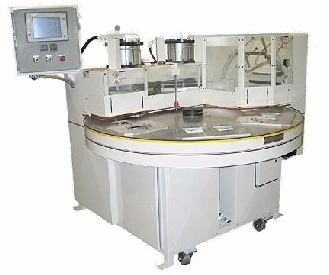 Custom tray sealing machines, heat sealer sizes and configurations for rotary tray heat sealers are available to meet your production requirements, semi-automatic and automatic. Contact us for quote and specs. Rotary blister tray sealer, tray sealing machine has touch screen control with PLC control system. 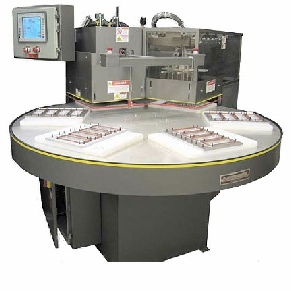 Can be used for validatable process control for medical device packaging with rotary tray sealer. Rotary tray sealer, tray sealing machine, side view of heat seal press, rotary tray sealer. Rotary tray sealer,tray sealing machine top view of heat seal press, rotary tray sealer.